9.75% Shriram City Union Finance Limited NCD – Apr'19 – Should you Invest? 9.75% Shriram City Union Finance Limited NCD – Apr’19 – Should you Invest? 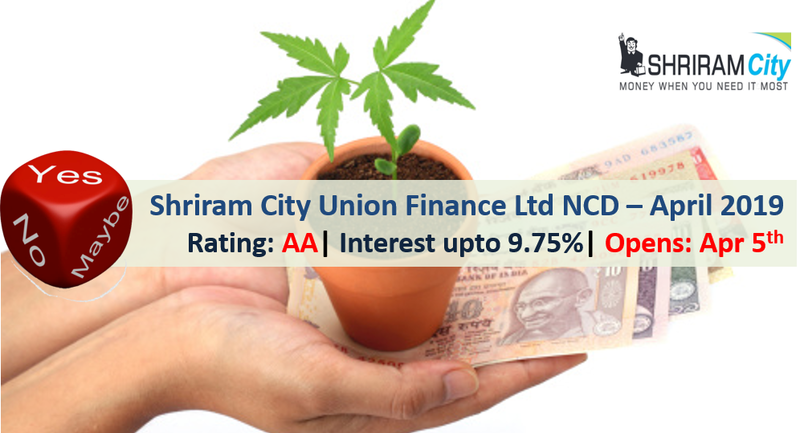 Shriram City Union Finance Limited has come out with public issue of non-convertible debentures (NCD) offering up to 9.75% interest rate. The company Company is a part of the Shriram group of companies, a prominent financial services conglomerate in India. It is a deposit-taking NBFC with multiple product offerings, including small enterprise/MSME financing, loans against gold,financing for two-wheelers, auto loans, personal loans, and housing finance loans. There are 8 options of investment in Shriram City Union Finance NCD. Shriram City Union Finance NCD – Who can Apply? This issue is open to all Indian residents, HUFs and Institutions. However NRIs cannot apply for this NCD. There are NCDs available in secondary market which have higher yields with similar rating. The problem is low liquidity and hence is difficult to buy in large numbers. The present Tax Free Bonds are offering yields up to 6.5% in secondary market, which is better investment for People in highest tax bracket. You can apply online by ASBA facility provided by banks. It’s the easiest way to apply and also avoids a lot of hassle in terms of KYC and paper work. Learn: How to apply for NCD issues using ASBA? In case you don’t want to do it online, you can download the application form from company site or Financial Institutions and submit to collection centers. 10% Muthoot Homefin (India) Limited NCD – Apr’19 – Should you Invest? 10.75% Magma Fincorp Limited NCD – Apr’19 – Should you Invest? 10.75% SREI Infrastructure Finance Limited NCD – Apr’19 – Should you Invest? 9.70% Shriram Transport Finance NCD – Jan’19 – Should you Invest?